Angiography alone doesn’t detect Ischemia and may lead to misdiagnosis when a patient is being checked for chest pain. A routine Functional Flow Reserve Measurement (FFR) after the angiography would lead to a change of diagnosis for 1 out of 4 patients according to a new study presented at EuroPCR 2013 by Nick Curzen, Professor of Interventional Cardiology, University Hospital Southampton NHS Foundation Trust and Faculty of Medicine, University of Southampton, Southampton, UK. Most cadiologists base their decision on the angiography only. 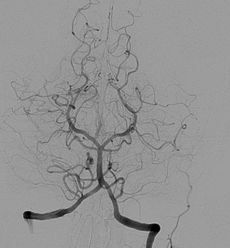 The angiography is an X-ray of the blood vessel (see picture) that the cardiologist uses to assess if some blood vessels are blocked or damaged. The study argues that angiography only doesn’t detect ischemia, a restriction in blood supply to tissues, causing a shortage of oxygen and glucose needed to keep tissue alive. This may lead cardiologists to fail to diagnose a medical condition and to develop an inappropriate treatment plan for the patient. Researchers, studied 200 patients suffering from Chest Pain. Each patient underwent an angiography. Based on the angiography only a cardiologist made a diagnosis and developed a treatment plan for each patient as well as recommendations for medical treatment such as percutaneous coronary intervention (PCI), coronary artery bypass grafting (CABG) or request for more information. The cardiologist left the room and then each patient had a Fractional Flow Reserve (FFR) measurement. Results with FFR were shown again to the cardiologist. Based on this additional information the cardiolgist changed the treatment for 25% of the patients.